The Caravan print + digital subscription for the International market. 12 issues in a year. The Caravan print + digital subscription for the Indian market. 12 issues in a year. India’s oldest motoring journals, dedicated to the passionate auto enthusiasts. 12 issues in a year. India&apos;s largest read women&apos;s magazine in Hindi. 24 issues in a year. India&apos;s most respected and loved Hindi magazine on politics, social affairs, fiction, and entertainment. 24 issues in a year. A bouquet of joy and learning, Champak is the largest read children&apos;s magazine in India. 24 issues in a year for Champak English. A bouquet of joy and learning, Champak is the largest read children&apos;s magazine in India. 24 issues in a year for Champak Hindi. A bouquet of joy and learning, Champak is the largest read children&apos;s magazine in India. 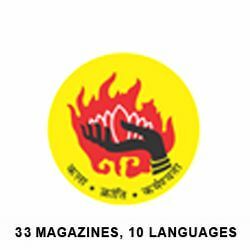 24 issues in a year for Champak Hindi + Games CD. Highlight Champs is a magazine for 6-12-year olds. 12 issues as in a year. Highlights Genies is a magazine for 2-6-year-olds. 12 issues in a year. India&apos;s favourite magazine on crime stories as well as thrilling entertainment. 12 issues in a year. A magazine loved for it&apos;s bold and entertaining collection of stories from real lives, including crime. 12 issues in a year. A magazine for the progressive farmer. 24 issues in a year. A magazine for the free-spirited and aspirational young adults. 12 issues in a year. A leading women&apos;s magazine in Malayalam for the progressive and aspirational women. 12 issues in a year. A bouquet of joy and learning, Champak is the largest read children&apos;s magazine in India. 12 issues in a year for Champak Kannada. A leading women&apos;s magazine in Kannada for the progressive and aspirational women. 12 issues in a year. Butti is a Kannada Magazine targeting youngsters preparing for competitive exams. 12 issues in a year. Nimmellara Manasa is a monthly magazine in Kannada targeted at the youth. 12 issues in a year. A leading women&apos;s magazine in Bangla for the progressive and aspirational women. 12 issues in a year. A bouquet of joy and learning, Champak is the largest read children&apos;s magazine in India. 24 issues in a year for Champak Marathi. India&apos;s most popular magazine for ambitious and progressive men from rising masses. 12 issues in a year. The leading women&apos;s magazine in Marathi for the progressive and aspirational women. 12 issues in a year. A bouquet of joy and learning, Champak is the largest read children&apos;s magazine in India. 24 issues in a year for Champak Gujarati. A leading women&apos;s magazine in Gujarati for the progressive and aspirational women. 12 issues in a year. A bouquet of joy and learning, Champak is the largest read children&apos;s magazine in India. 12 issues in a year for Champak Tamil. A leading women&apos;s magazine in Tamil for the progressive and aspirational women. 12 issues in a year. A bouquet of joy and learning, Champak is the largest read children&apos;s magazine in India. 12 issues in a year for Champak Telegu. A leading women&apos;s magazine in Telegu for the progressive and aspirational women. 12 issues in a year. India&apos;s favourite Urdu magazine on crime stories as well as thrilling entertainment. 12 issues in a year.